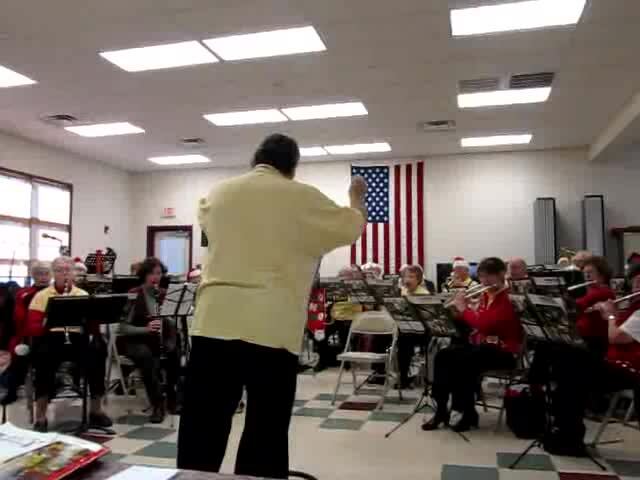 The New Horizons Band conducted by former conductor Chris Bonebrake playing at the Aviation Museum Event at the Hagerstown Airport on Sunday, September 21, 2014. Concert Band at Community Band Festival on July 27, 2014. We were joined by Rohrsville, Williamsport, Wayne and Shippensburg bands. We had a great time joining with the Barbara Ingram School for the Arts Band to present a concert on May 29, 2014, 7:30 PM at the Maryland Theatre. The concert was outstanding and we got to meet some of the students shown in the picture below. Hats off to everyone who made this possible. Let's do it Again! Here below are four of the songs we played together. Please go to the videos page for the remainder of the concert. Pictured: Front Row, L to R: Chris Bonebrake, NHB Band Director, Olivia Dorsey - Flute, BISFA; Barbara Couch - Bass Clairinet, NHB; Wayne Ross - Alto Saxophone, NHB; Bill Hollin, BISFA Band Director; Back Row L to R: Mason AskinÂ - Trombone, BISFA; Evan Mohn - Clarinet, BISFA; Jon Grossnickle - Trumpet, BISFA; Paul Couch - Trumpet, NHB. We are the New Horizons Band. A group of senior musicians who are celebrating our 17th Anniversary this year. We might also be known as "Hagerstown's other band". We number about 50 members and we meet most every Friday for practice from 1 - 3 PM at the Hagerstown YMCA. Interested in playing an instrument that you may have not touched since high school? No problem. come join us. The band is under the direction of Mr. Chris Bonebrake.